Whale Conservation: It’s Snot What You Think! I had an amazing summer working for Ocean Alliance in Gloucester, MA. My externship focused on reviewing and coding SnotBot footage, compiling hormone and thermal imaging reports, and participating in field research. 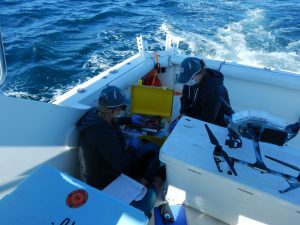 I had the amazing opportunity of participating in a research expedition off of Chatham, MA, working collaboratively with NOAA, on exhaled breath condensate and photogrammetry research. On local research trips I assisted with recording behavioral data, photo identification, and drone cleaning. As well as having a focus on whale research, I assisted with grant research, fundraising events, and marketing campaigns. Having an existing knowledge of the MMPA, ESA and CITES were especially helpful when reviewing research permits and protocols. I was able to learn more about the many hurdles that small nonprofits face, such as, funding and permitting. 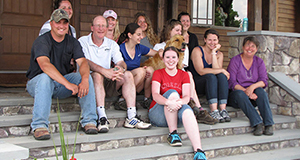 My time in the MAPP program and my internship experience at Ocean Alliance have prepared me for a future career in animal advocacy or conservation. 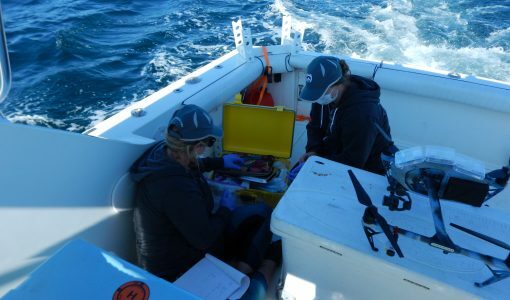 Alicia Pensarosa and Britta Akerley, Ocean Alliance Data Manager, are processing whale snot. This is during their Stellwagen Bank National Marine Sanctuary Expedition using Ocean Alliance’s Parley SnotBot drone to collect exhaled breath condensate from humpback whales. They are looking at DNA, stress hormones, pregnancy hormones and microbiomes.